Reformed Credobaptist: Revelation, by James M. Hamilton, Jr.
James Hamilton has written a fine commentary on the book of Revelation. As part of the “Preaching the Word” commentary series, he has followed the flavor of the series by keeping the content at a more popular level (avoiding extensive footnotes and highly technical discussions) with a large amount of meaningful application. Although not stated explicitly in the book, Hamilton appears to write from a kind of idealist and futurist perspective. His view on Revelation 20 is Premillennial (historic). Hamilton parts ways with Dispensationalists regularly in this text, making it clear that he is not a Dispenationalist. For instance, Hamilton takes the perspective that God will preserve his elect through the tribulation, not remove them in a prior rapture (p. 116). He understands “Daniel’s seventieth week” as the entire age between Christ’s first and second coming, not as a final seven year tribulation at the end of the church age (pp. 171-72, 194). He rejects a straight chronology, holding to a form of parallelism or recapitulation where the same period of time is depicted more than once using differing imagery (p. 188). He does not believe that a new temple will be rebuilt in Jerusalem (p. 234), and he sees the two witnesses of Revelation 11 as representing not literal figures but the church proclaiming the gospel during the church era (p. 237). This commentary had many strengths. First, it was very readable. As mentioned above, one does not get bogged down in highly technical discussions or distracted by any number of potential scholarly debates. Hamilton tips his hat to other perspectives where it is appropriate, but keeps the flow moving. Second, the commentary had a devotional quality missing from many commentaries. The length of the chapters (being ten to fifteen pages a piece) and the significant amount of application in each chapter made for great devotional reading. I actually used this commentary as a supplement to my daily Bible reading as I read through the book of Revelation. That was a tremendously edifying experience. Finally, Hamilton models careful exegesis in making his decision of how to interpret the Millennium by comparing the casting of Satan out of heaven in Revelation 12 with the text of Revelation 20. While he ultimately is convinced that the millennium is future, he does not let his Millennialism dominate as Dispensational Premillennialists sometimes do, especially at the popular level. His careful work in the text shows that one's decision about the Millennium in reality does not radically affect how one interprets the rest of the book. For Hamilton, the millennium is not the main event of the book of Revelation. There are only a few minor weaknesses to mention. Second, in certain places I was left wondering how a particular symbolic representation will take shape in real history. Chapters often seemed to move from Old Testament background to present day application without commenting adequately on how a given prophecy might be fulfilled in real time and space. For instance, it may be true that a locust plague referred to a human army in Deuteronomy 28 and Joel 1 and 2 (p. 215), but how will a human army literally be a part of God’s final dealings with this present age? What about the substantial destruction of the world’s natural resources? What about Armageddon? While I appreciate Hamilton’s seeming aversion to charting out an end times chronology, I think he might do well to address the propensity that readers still expect to find out something about what is really (rather than symbolically) going to happen. I suspect Hamilton has provided as much detail as he feels comfortable giving without going into wild speculation. He comments in one place that God “has given us symbols, not specifics” (p. 324). 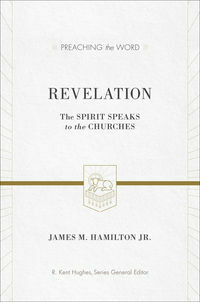 In conclusion, James Hamilton’s commentary on Revelation is well worth reading. Not only will you learn more about the book of Revelation, but you will learn much about how to apply this important book to your life. I received this book for free from Crossway Publishing to provide a review.